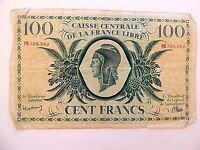 France 5000 Francs Banknote (1945) P# 103c F to VF - Depicting "French Empire"
1941 France 10 Francs Banknote, Pick# 84, Lovely, Very Nice! 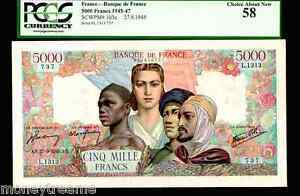 FRANCE P103c "ALLEGORY of FRANCE" 27.9.1945 5000 FRANCS- FRENCH COLONIES GRADED PMG 58 ALMOST UNCIRCULATED! FRANCE "Allegory of France" ~. Double your traffic.